Beers brewed to style can be great. But sometimes they can box in a brewer. Sometimes you need to go outside of the box to find the cool stuff. “Washed in Black” is one of those beers. I created this beer years ago specifically to have all of my favorite things in it. Thankfully, everybody seems to like a lot of the same stuff I do. It starts with a fairly typical IPA grain bill. From there, we add a substantial amount of Rye malt that adds a great bite that balances out the sweeter malts. Finally, we add Black malt which adds a touch of dry roasted flavor and washes the beer black. Hence: “Washed in Black”. “Washed in Black” is a great descriptor of the beer. It is also an homage to a great band. “Washed in Black” is lyrics pulled from Pearl Jam’s “Black”. One of my favorite songs from my favorite band. As you taste this beer, try to find the subtle roasty notes up front followed by the crisp spicy rye and sweet caramel malts. And finally, the bitter punch of Simcoe and Columbus hops on the end. A beer competition judge may say that this beer is out of style. There is no such thing as a “Black Rye IPA”. That is just fine with us. We just categorize it as “delicious”. Going into our 4th weekend of business we are starting to see a few trends emerge with our beer. One of those trends is that Breakfast in Maui is the most remarked on beer. The idea that our stouts would be so popular a solid 2-3 months before the unofficial start to “stout season”, was a little off our radar. But both of our big stouts, Breakfast in Maui and Crazy Putin, have been very popular. This blog I thought I would take a minute to pull back the curtain on Breakfast and Maui. This recipe comes from our good friend Dave Kippen who is nice enough to lend us his brewing expertise on occasion. The base beer for this is a big but drinkable stout of 9.7% ABV and 64 IBU. Complex roasty character comes from plenty of Roasted Barley, Special Roast, and Black malts. While this beer ferments we get our special ingredient started which is cold steeped Hawaiian Coconut coffee. The cold steeping process keeps all of the smooth coffee and coconut flavor without adding extra bitterness. The finished beer you are left with is a lot of big flavors that come together very well. Coffee, chocolate, and coconut dominate. Think of eating a mounds bar with a cup of coffee. We think it is one of the more unique coconut or coffee beers you will find. Come in and try one. To pique your interest more, this is only the first of what will be a series of breakfast stouts. Coming in the not so distant future will be “Breakfast in Ireland.” Stay tuned for more on that one later! Saturday July 15th we will have a special beer on tap starting at noon until the keg blows. Live Oak is an imperial red rye IPA coming in at 9.0% abv and 80 IBU. This is a big beer that is a touch on the boozy side but very drinkable at those numbers. Live Oak is a special beer to us that was made to remember and pay tribute to a friend. Our good friend Scott Swingle passed away tragically on May 29th at the far too young age of 36. Scott was a big supporter of what we were doing at 4 Two 4. He couldn’t wait to come up from Indianapolis to check out the brewery. Unfortunately, that never happened. If you knew Scott, you knew him to be a genuine, honest, and fun guy. He lived his life with absolutely no filter. He said a lot of things publicly I would only say in the most private settings. Scott was smart as hell and had wit as sharp as a tack. Somewhat of a professional instigator, his twitter handle was @ThatDickScott, where he had quite the following. And that was his public persona. Being a lifelong Buffalo Bills fan living in Indy may have contributed to his need to find entertainment on the interwebs. But beneath that, he was about as real of a dude as you will meet. Still rattled from hearing of his death, I sat down to think about what a beer that represented Scott would be. He was a connoisseur of all fine booze. I was always jealous of his palate being good enough to distinguish good beer, good wine, and his fav—good whiskey. I also wanted to capture his in-your-face persona and bigger-than-life personality. What I came up with was this big, aggressive imperial red rye IPA fermented on sliced bourbon barrel staves that were soaked in rye whiskey. (He drank more bourbon but really loved rye). It’s kind of an out there recipe that won’t be for everybody, just like him. But if you like the things he did, I think it will be perfect for you. And if this beer is a little too strong for you, he would probably have a chuckle at your displeasure. It will be our great honor to share this beer with all of you. We hope you all take a second to give a cheers to the man that inspired it and maybe remember someone special to you that has passed on. 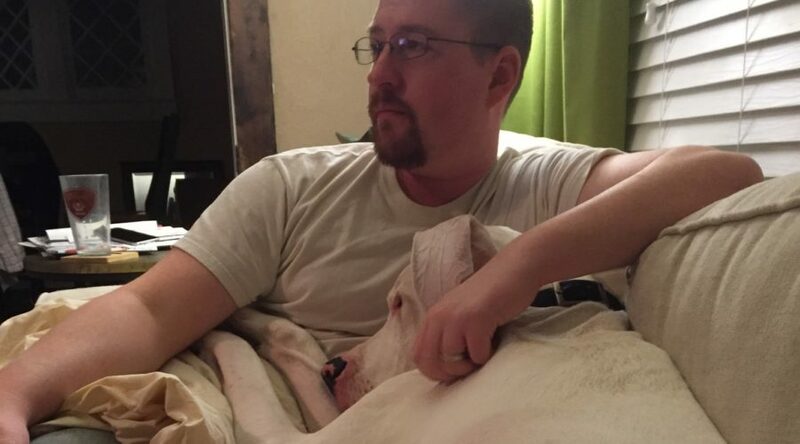 Scott is survived by his wife Andrea Swingle and their larger than life Great Dane, Hugo. Scott was a huge dog lover. 50% of the profits from this beer will be donated to Forever Friends Great Dane Rescue in Indianapolis where they adopted Hugo. World’s smallest commercial brewery… probably and exaggeration, but not by much. Two ½ bbl systems are all we have to keep a beer in your hand. This means we produce one keg at a time, literally. Of course, we added some smart solutions that speed up the process, such as a big instant hot water heater that allows us to mash in without having to wait for the water to heat and larger kettles that allow us to net out a full keg. However, you can only speed the brewing process up so much. This is why we are open on weekends only for now. “What kind of idiot would open a brewery in a high traffic area with a tiny system?” you might ask. To which I proudly reply “this idiot.” You see, we knew we wouldn’t be able to keep up with this system. This very same system is the one Our Brewing Co. opened with 5 years ago when they constantly were running out of beer. It was through that process that I became good friends with the folks down there and became their weekend shift brewer that helped keep beer on tap in the first 6 months at Our. It was through that experience that I learned what an unsustainable hustle it would be to start with a system this size. Unfortunately, or possibly, fortunately, depending on how this plays out, it is what we had to do. When we began planning this brewery we had intentions of starting on a 3 bbl system with 8 fermenters, 2 brite tanks, and a glycol system. Early in the project, we ran into some financial snags. Looking back it all worked out great because those snags are what allowed us to keep 100% ownership and control of the brewery. Unfortunately what it meant was that we would have to put all the money we could scrape together into the build out to pass code and get the doors open. A second mortgage, cashed out retirement accounts, money from our parents. We are so far extended at this point; it’s just not possible to get a bigger system yet. I cobbled together a plan that would allow us to make enough beer to be open on the weekends to get the revenue flowing. Sure, this plan requires keeping our day jobs and basically brewing non-stop 7 days a week until we can get our next system. But we already established “this idiot” likes to bite off more than he can chew.Speaking of, did I mention we are also expecting our first child in December? All of this brewing is just good sleep deprivation training for when the baby comes. 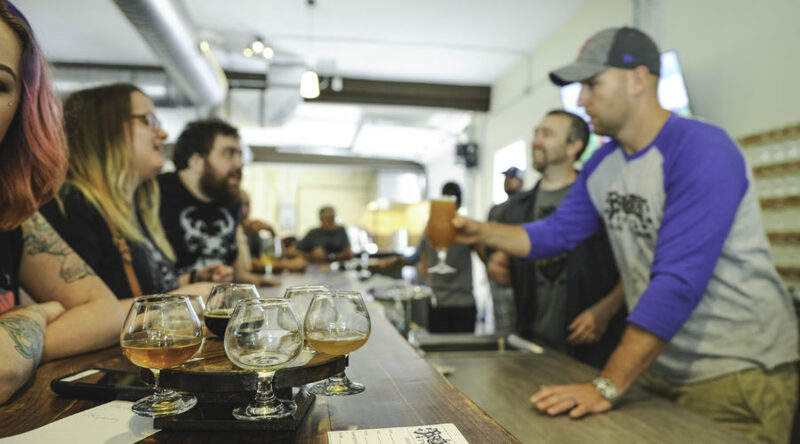 One of our core beliefs is that in this ever more saturated brewery market the way for a small brewery to succeed is to start slow, build a loyal crowd, and not overextend too fast. The tough part of that is finding the loyal crowd that is willing to be patient and wait for you to grow into something cool. Judging by our first openings and offerings, we have found that crowd. If you are still reading this, you must be one of the cool kids. Thank you for your patience, thank you for your support. With your continued patience we promise to continue to pour more time, effort, and funds than we ever thought possible into making this your brewery. Cheers! It was a long road to get here. A long, bumpy, winding, hilly, scary road with no guard rails. We experienced nearly every hiccup, roadblock, and delay that you can experience in opening a brewery. Getting to opening day is definitely a milestone and something to be celebrated. However, the unrelenting uneasiness of “Did I mortgage my whole life on a losing idea?” is always rattling around in the back of your head. Did we get the beer right? Did we get the space right? What if everybody hates this place? Fear is an amazing motivator. It can push you harder and longer than you would have ever thought possible. The final push to get the doors open was definitely fueled by fear (and caffeine). By no means are we content. The space and the beer will continue to be tweaked, improved, and pushed towards what we view as perfect. But for now, to see the response so many of you had to our dream this past weekend was truly humbling. We saw somewhere around 1,000 of you pass through our doors this weekend. Somehow we managed to not run out of beer and yet not carry much over. We had a few glitches with our point of sale system and got a little backed up, but everybody was patient and understanding. It should also be pointed out how responsible and under control everybody was. So many of you had great things to say about the beer and the ambiance, we don’t even know where to start with how to thank you. But let’s start with this: We promise to not relax, or rest on our laurels. We will continue striving to improve everything about our business to give you the best experience possible. And yes, as soon as we can get through some emergency debt we acquired to get the doors open, we will be working on a bigger brew house to bring you more hours and crowlers for carry out. Just keep coming in and grow with us, it will happen. In the meantime, relax and have a beer. Cheers! June 25, 2017 By Brewery 4 Two 4 in Blog, Craft Beer Comments Off on Grand Opening is less than a week away! Grand Opening is less than a week away! We want to thank all of our friends (old and new) and family who helped us break the ice at our soft-openings. We are now busy putting the final touches on the tap room and making some updates based on the feedback we received. We are anxiously awaiting this weekend, and we can’t wait to open the doors for good (at least every weekend to start)! During the weekend, on Friday and Saturday, we have the pleasure of being involved in Holland’s first ever beer tour. 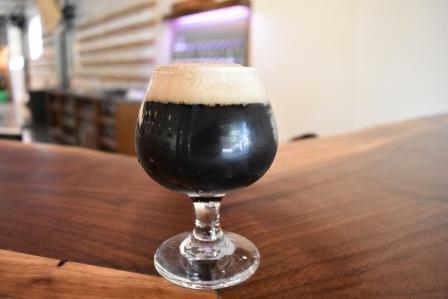 The Holland Beer Tour will take you to all the celebrations going on in town from our grand opening to Big Lake‘s 4th anniversary party, Brew Merchant‘s 1st anniversary party, and to Our Brewing where there’s always something happening! Check out the link for tickets. It’s gonna be a great beer weekend in Holland! We’ve received some great press coverage in the last few days. Special thanks to MittenBrew for beautifully telling our story through print and pictures! Check out the story below. Definition of tortuous: marked by repeated twists, bends, or turns: winding a tortuous path. You know what they say, “Nothing worth having comes easy.” When we think about what it took to get to where we are today, the only way to describe it is when we met a fork in the road, we took the tortuous and more tortuous path. However, we would not change a thing, because, in the end, we have made it. But, this is only the beginning of our journey, the rest we get to share with you! Opening a brewery is never easy with all the hoops and red tape you need to navigate, but we have made it exceptionally hard on ourselves. We started this journey about three years ago and the dream for it about seven years before that. We thought we had it all figured out—we had the perfect plan, only needed to execute it. Things did not go as planned, as they never do in the craft beer business. The important thing, however, is we just kept going, failure was not an option. Our journey to opening the brewery included considering 13 different locations and multiple plans. Once we finally decided this location was our spot, there was another year in planning and hoops to jump through. 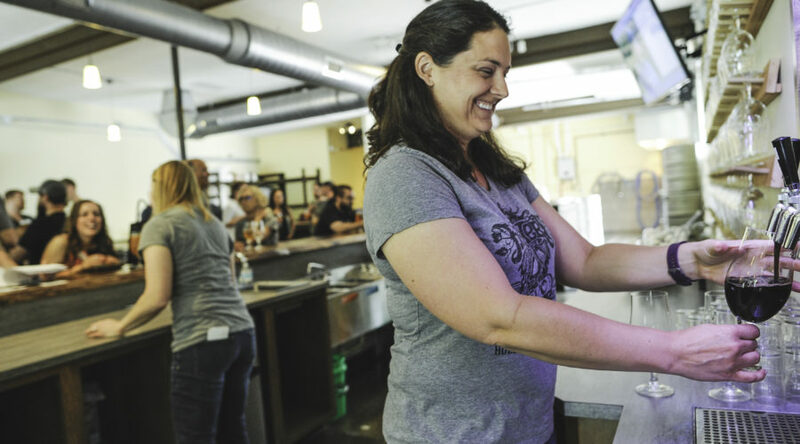 We needed local approval, then there was the processing of obtaining a microbrewer license, and then there were even more delays that stopped us in our tracks. By the time we were to a point where we could start again, we realized we actually needed to go in a completely different direction. We chose to move forward without any other ownership interest, which was the right decision but it added an extra year to our plan. Since you’re reading this, it is pretty clear that we did not give in. We decided that we could make this brewery work and we were willing to bet the house on it, literally. Our plans had to change, but we were determined to grind. We are starting with a brewing capacity a fifth of the size we originally planned. The good news is it’s the system we have been brewing on for years, and it also means we will always have something new to try on tap. 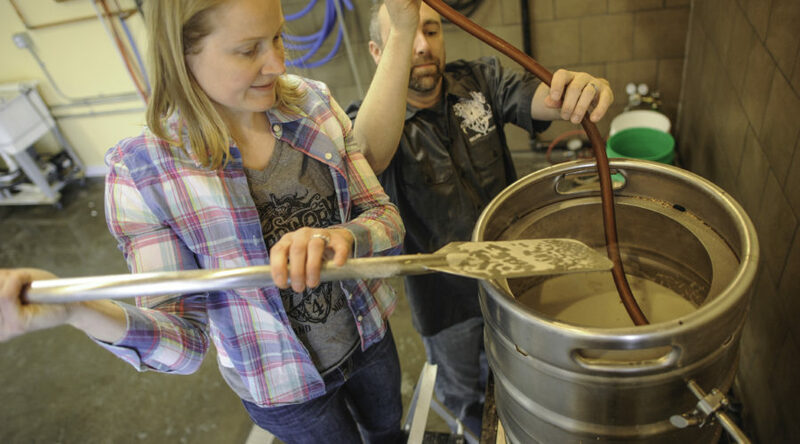 Plus, It will give us more opportunities to brew whatever we want and to be experimental. Sure, we will run out of beer at times, and we will have limited hours initially, but what we are doing is working towards a goal of growing and expanding production so we eventually can bring you more beer and extended hours. So why are we telling this story? It certainly wasn’t the best of times, but it wasn’t the worst either, and it has made us stronger. We just want to convey to you, our customers, our conviction and dedication to this project and this gathering place we call a brewery. We have fought hard to get to opening day, and now we can shift our energy into making Brewery 4 Two 4 the best it can be. We will be damned if we cut corners and serve sub-quality beer. We may not make much beer at once, but what we do make will be done with pride and quality in mind. We want our little corner of the brewing world to be the best it can be for our community. Cheers to our beginning and joining an already great beer community. We look forward to serving you a pint or two of our hard work. 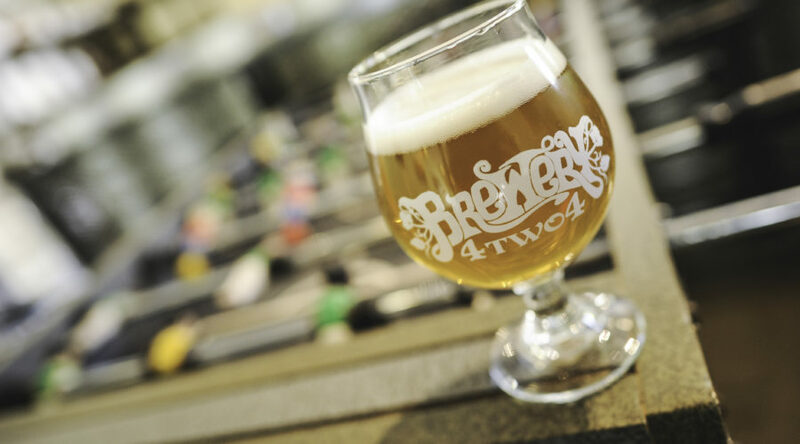 Subscribe to our newsletter to find out about special events at Brewery 4 Two 4. 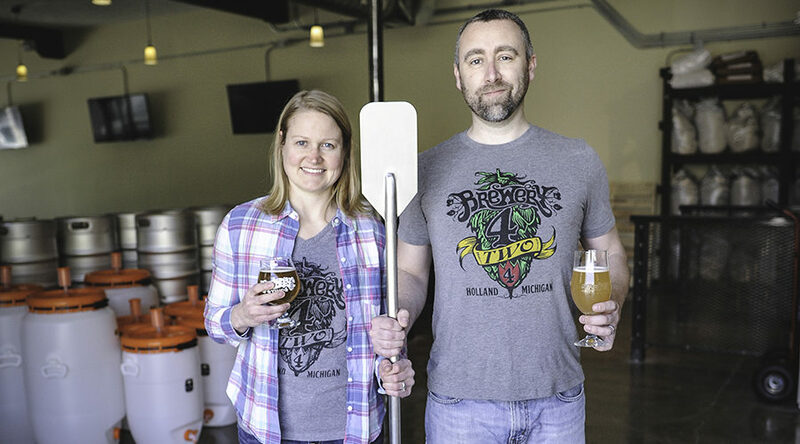 We are Holland, MI’s north side neighborhood brewery – it’s even in our name! We want to provide something for everyone in a welcoming space for locals and visitors alike. We brew beers for every palette, for every beer drinker from novice to enthusiast. Pales, IPAs, Saisons, Stouts, Fruit beers, and Barrel-Aged beers, we will craft quality beers to share with you in our brewery. Beer is a beverage meant to be enjoyed and shared by all. Join us in Holland for a glass! Must be 21 to consume alcoholic beverages.